A survey of more than 1,700 people has confirmed what is possibly the world’s worst kept secret: lottery players are on a hiding to nothing. Discount website VoucherCodesPro has estimated that the amount lost by weekly National Lottery players over the course of the year is just shy of £150. With £3 the average amount spent each week – a Lotto and Euromillions ticket the most popular combination – the cost mounts up to £156-a-year, with players saying on average they will win just £10 of this back, the equivalent of getting three numbers on Lotto. 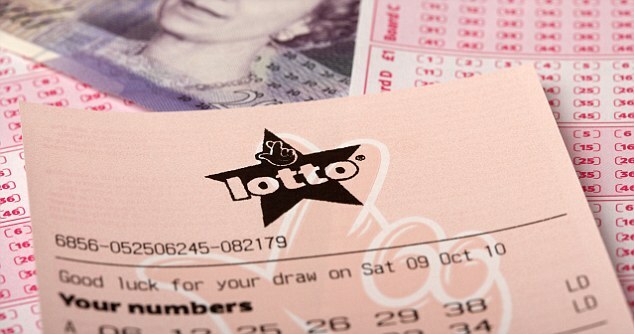 Expensive habit: Playing the lottery each week loses players on average £146-a-year. Some might say that’s a fair price for the hope of a win and the gambling buzz. As is typical of a game that plays on the emotions, hope and fear are the two main factors which prompt people to keep playing. George Charles, of VoucherCodesPro, said: ‘I think the majority of people at some point have dreamed about winning the lottery. Surely it’s the answer to all your problems? ‘The majority of worries in life could probably be alleviated to some extent with a huge sum of money. But it seems that wishful thinking could also be adding to our woes. Almost two thirds of respondents to the survey said they played purely for the hope of winning, with others rationalising that you ‘have to be in it to win it’. Others are those with regular numbers who keep playing as they are so terrified that they will lose out on millions if their numbers come up after they give it up. The costs will rise for players from this autumn when the price of Lotto tickets increases from £1 to £2, though the prize for matching three numbers will also increase from £10 to £25. Some £6.5billion was spent on National Lottery tickets during 2012, and since its inception in 1994 around 3,000 millionaires have been created. But the chances of winning the typical six-ball Lotto draw stands at around one in 14 million, with the odds of matching just three numbers about one in 57.